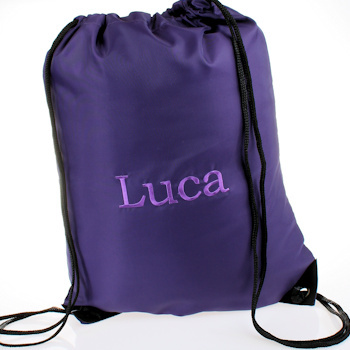 Purple Gym or PE bag ideal for school sports, swimming or gym clothing and accessories. Purple Gym or PE bag ideal for school sports, swimming or gym clothing and accessories. Nylon lightweight but sturdy gym bag that can be personalised with a name of your choice.